The Fukushima-1 Reactor at Daiichi is a General Electric BWR-3 design with Mark I containment. It turns out that the Boiling Water Reactor at Oyster Creek, New Jersey, is an almost identical design: BWR-2 with Mark 1 containment. 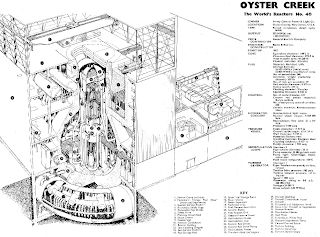 Oyster Creek is the oldest operating commercial nuclear reactor in the US today. Here's a very, very pretty picture of Oyster Creek. The above is from a University of New Mexico archive of fascinating drawings of nuclear power plants from around the world, which will make almost any nuclear engineer drool. You can get the full pdf of Oyster Creek here. In particular (I think you need the full pdf to see the detail), note the location of #14 (the spent fuel pool), #6 (safety valve -- this is probably what they used to burp the reactor), and #27 (the recirculation pump, which is what's keeping the water circulating and core cool right now). Fukushima-1: 460 MWe, initial criticality in October 1970. Oyster Creek: 619 MWe (it's been uprated a few times), began operation on December 23, 1969. Fukushima has some distinct design differences from Oyster Creek. For example, item 10 above (Isolation Condensers) do not exist in Fukushima Unit 1. If I am not mistaken only Oyster Creek and two others in the world have them. This design feature was removed after 2 BWR/2's basically to save GE/utilities money. Fukushima 1 is BWR/3. If this one feature alone existed at the Fukushima plants, they could have relieved reactor pressure without electricity, without venting radioactive gasses/hydrogen, and without losing reactor inventory resulting in uncovering fuel. It's critical valves are DC operated, so loss of power is irrelevant, and it works without pumps, by gravity. GE BWR's brought these simple and effective condensers back in its new designs. If Fukushima 1 had isolation condensers, they would have attained stable hot shutdown and the plant would not have been destroyed, this goes for the other units as well. The spent fuel pool would have still been an issue, but it also would have received more immediate focus and could have been kept full using diesel pumps. The safety valve was not likely used to relieve pressure, as by the time that automatically activated they let pressure get out of control to the point where it is almost at the design limits for the vessel. Electromatic relief valves off of the main steam lines were almost undoubtedly used instead, which dump steam directly into the suppression pool, which is the massive donut shaped structure at the bottom, through large nozzles. The steam then collapses to water averting a huge pressure spike in primary containment, as obviously water takes up a much smaller volume than steam. Releasing steam to relieve pressure results in uncovering fuel. When fuel Is uncovered the fuel temperature rises to very high levels, and at around 2200 degrees F the cladding, made of zircaloy, begins to react with the steam to produce hydrogen gas among other things in an exothermic reaction, producing more heat. The hydrogen is then later vented with the steam, does not condense in the suppression pool, and helps to pressurize the primary containment. The primary containment is maintained filled with nitrogen gas (zero oxygen) for this very reason to prevent the possibility of a devastating explosion within the primary containment. The problem really presents itself when they vent the primary containment to the reactor building atmosphere to relieve pressure, and the hydrogen sees oxygen and the slightest spark causes a massive explosion as we saw on the news. Oyster Creek also has a hardened vent system, as would all Mark 1 BWR’s in the US as per a 1989 NRC order that identified this possibility. As a result the primary containment would not have been vented into the reactor building ducting, but instead through a strong metal pipe to outside of the reactor building. Hydrogen explosions would then occur outside, and the reactor building roof does not blow off as we saw. Recirculation pumps do not provide cooling. Their purpose is to increase reactor power during power operations by reducing the void coefficient of reactivity I (too long to explain). The pumps they need to restore for vital cooling are Rx Bldg closed cooling water, shutdown cooling, fuel pool cooling, and service water pumps, which remove decay heat from the fuel pool and reactor vessel through a series of closed loops sending the heat to the ocean. However much more immediately they need their emergency core cooling system, containment/suppression pool cooling. None of those systems are shown in the diagram except the S/D cooling heat exchangers (28). Basically they need to restore power to most everything in the reactor building. Restoring power has been difficult to do after the tsunami flooded out much of their critical infrastructure, including and especially their emergency diesel generators, and vital electrical busses. The plants are all still in pretty bad shape, and there are no easy fixes. Sorry for my questionable sentence structure and grammar, I studied engineering, not english, haha. Also, as a disclaimer, my post was a combination of mostly fact, but also some of my opinion/speculation extrapolated from knowledge of similar plants. I have no first hand knowledge of the exact design of Fukushima Unit 1. Wow, thanks, 6. You're a heckuva lot smarter than I am about BWR designs. I'm sorry to hear that the isolation condensers could have played such a key role in this accident, but they weren't in the design. Actually, I'm surprised at the number of measures you cite that were not in the Japanese design. I had (naively) thought they were more on top of things. Bummer. But thanks for your insight. You might also be interested in today's Wall Street Journal article about administrative efforts that slowed down the response. From the article: "This disaster is 60% man-made." I've been following this in the original Japanese and on the internet and 6's above is the most clearest explanation I've seen. if I could. It's partly in Japanese but a reactor engineer should be able to read most of it. Several posts on the TEPCO website and other reports discuss Dai-Ichi 1 cooling down using an isolation condenser. This seems to conflict with what 6 said about Unit 1 not having an isolation condenser. Fukushima 1 actually had (has) an isolation condenser, however the valves were kept closed most of the time during the start of the accident when the power was lost. Had the valves been kept open... maybe unit 1 would be O now. We really need to find out more what happened, Tepco reports clearly indicate the inappropriate operation of the isolation condenser. Why on earth was the cooling not used? I was very wrong about some of the information I gave, particularly the existence of isolation condensers and a hardened vent at Unit 1. I had been grossly misinformed. For anyone who is still interested, a very descriptive and reputable account of what happened was released by INPO earlier this month, and is an interesting read. They did not improperly operate the isolation condensers; they were cycling them on and off to slow the cool-down rate of the reactor pressure vessel. While excess cooling may seem like a good thing, brittle fracture of the pressure vessel could occur if the cool-down is too rapid, and that is what drove the operators to act they way they did. The problem came when they happened to lose all AC and DC power right after cycling them off. Anyway, there is a ton of information in the above document, and it should satisfy most people’s curiosities. Does it affect the performance of the containment if it's for a water container or a nuclear power? The two has different matters contained, so would it affect the flow within the containment? 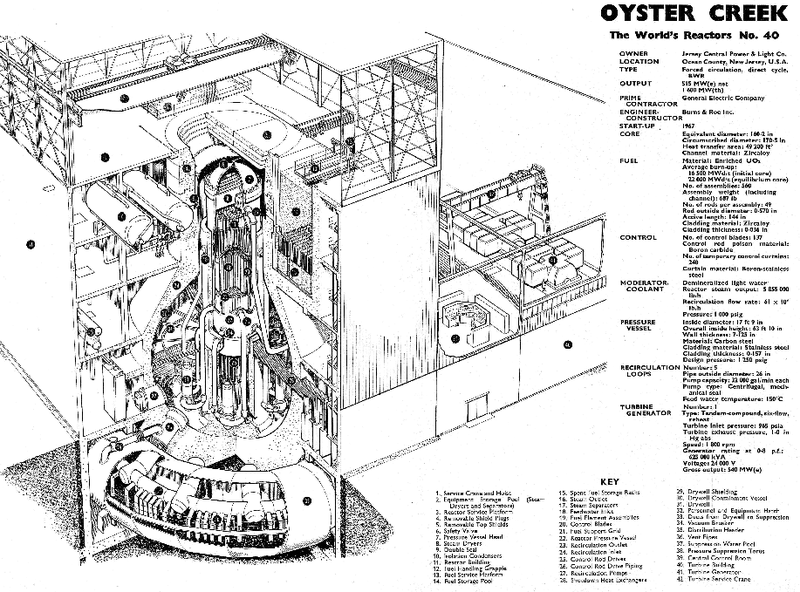 Unit one Reactor 1 did have condensers, like Nine Mile and Oyster. But these weren't operating effectively due to amendments in pipework design back in 67 (most likely half closed valve). As a result the condenser couldn't fill with steam to turn into cooling water again. Thus the reactor had loss of coolant due to the system being open to atmosphere through loss of steam at pressure vessel head.